Erupting from the Baltimore asphalt in early 2012, Foghound honed their heavy fuzzed out grooves by wrecking stages and eardrums across the East Coast and beyond. They released the debut album “Quick, Dirty & High” in 2014 on Moving The Earth Records and showcased a full-throttle hill climb of dirty stoner rock that demanded international attention and landed on multiple “Best of Year” heavy music/ stoner rock lists. 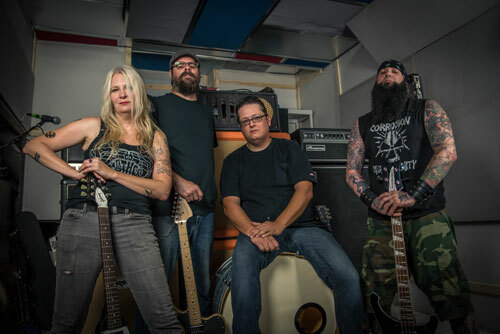 In January 2015 Foghound set about recording their follow up “The World Unseen” in Raleigh North Carolina with Mike Dean (of Corrosion of Conformity), holing up in the studio and tracking on 2-inch analog tape with additional recording and mixing taking place at Hudson Street Sound with “The Punisher” Frank Marchand a few months later. The forthcoming record highlights the bands growth; darker lyrical images lay the groundwork for even bigger riffs, layered vocals and more focused textured dynamics. The current lineup now features the former Sixty Watt Shaman “rhythm section from hell” with the addition of bassist Rev. Jim Forrester back alongside Chuck Dukehart III (drums/vocals). With riff slingers Bob Sipes (guitar/vocals) & Dee Settar (guitar/vocals) this new supercharged lineup has set about redefining the Foghound sound. The new full length album, “The World Unseen” is set to be unleashed by Ripple Music in early 2016.